SHARP BROWS LIGHT MICROBLADING - INCREDIBLE CHANGE! SharpBrows is approach to microbladint that allows the slices into the skin to be made with utmost precision. 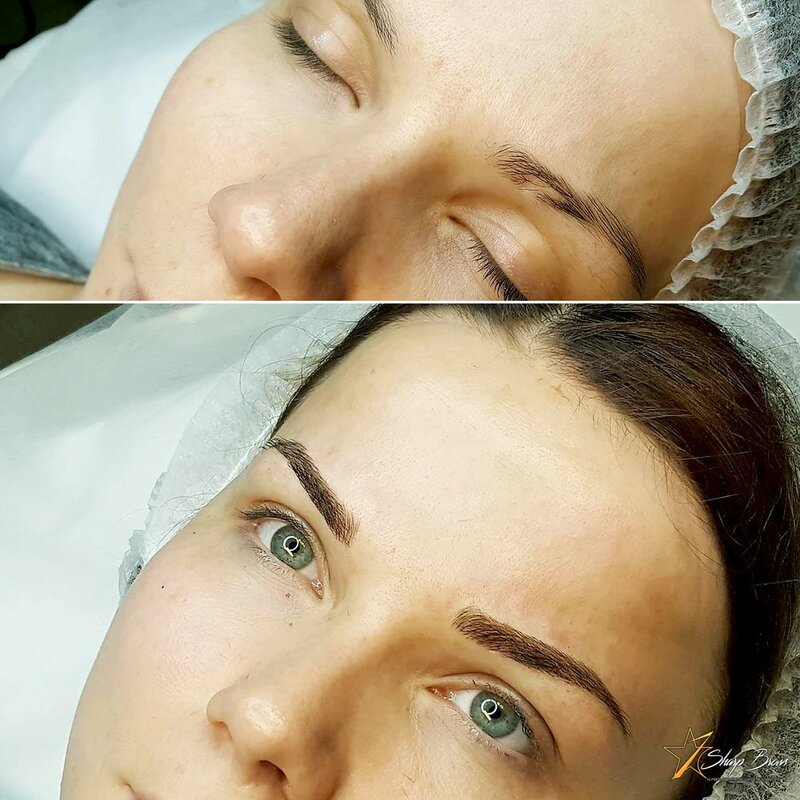 The result of the SharpBrows microblading procedure is a set of beautiful sharp brows that are not shaded (yet). What exactly is this SharpBrows microblading? First and foremost you still have to understand that microblading in its essence is not permanent brow tattooing that many salons provide. 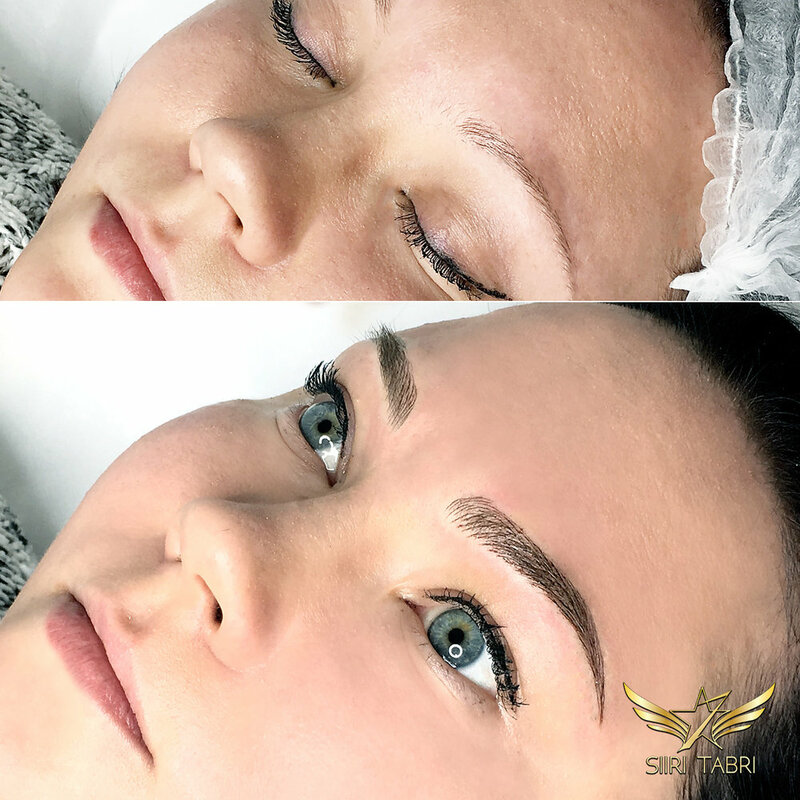 SharpBrows microblading avoids tattooing brows permanently into the skin because that is greatly against our basic principles. Microblading is a brow design approach that allows to maintain the personality and beauty of the natural brows of the client. During the microblading procedure a thin layer of pigment is sliced into the surface layers of the skin. The pigment we use is also 100% natural thus it does not hurt the skin nor does it provoke any unnecessary reactions from the body. 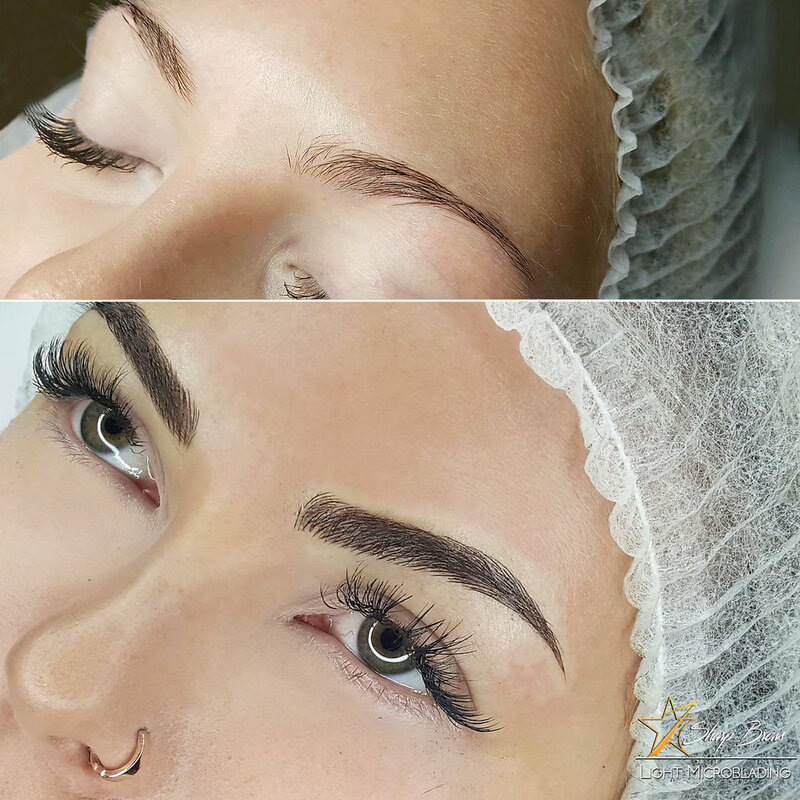 Although this procedure is a little like tattooing there is a major difference between microblading procedure and permanently tattooed eyebrows. Namely brows created with the microblading technology will dissolve within about a year. This means that the results usually last for a good year and after approximately 10-12 months the color fades away. UPDATE: When it comes to Light microblading we have been asked countless times about the differences in the technique between the conventional and Light method. The main difference when it comes to actually making microblading lies within the number of phases pigment is applied into the skin. With conventional method the number of rounds was ofter quite small (around 2-3) and many artists tried to push the pigment into the right depth during the first phase. With light microblading the overall approach is totally different. It should not even be artists' intention to push the pigment into the correct depth during the first phase. We merely scratch the upper layer of the skin very gently (quite often with no pigment or minimal amount of pigment on one side of the blade), then in the following phases we go deeper every time. There are several precise techniques that allow to understand when there is enough pigment in the correct depth in the wound and following those the artists can determine the number of phases. Quite often it may reach 4 or even 5. 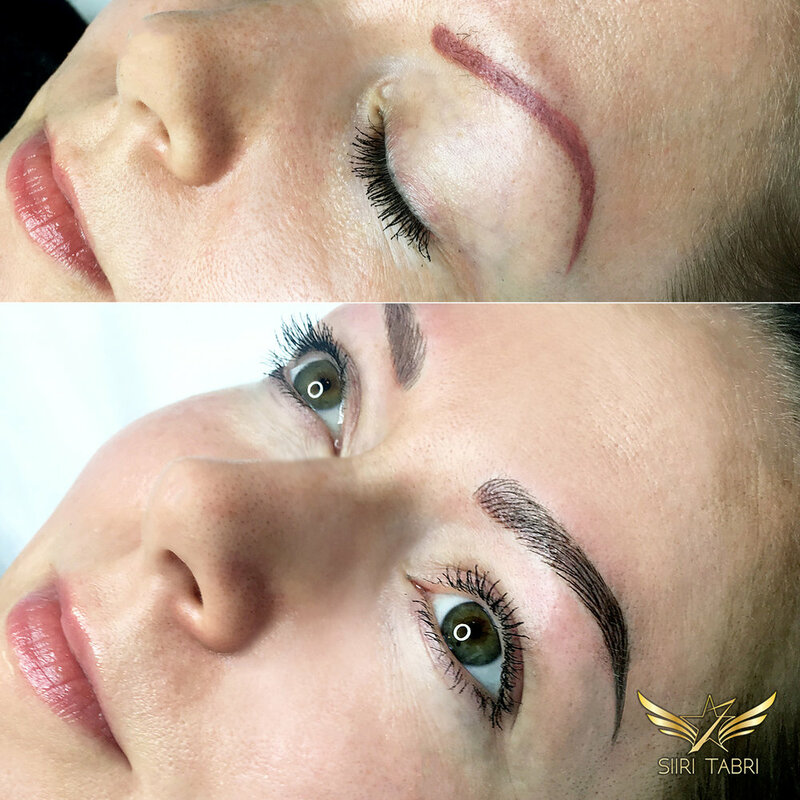 Usually SharpBrows microblading lasts for a year - that is also a commercial tagline for many service providers. However the quality of the result as well as longevity greatly depends on the quality of the job done. As we have repeatedly told our customers, there is a realistic need for 2 retouching procedures and depending on the skin type and individual differences, maybe also for three retouching procedures during the year from the initial procedure. As a rule those procedures are carried out during the first months after the initial procedure. UPDATE: As mentioned earlier with Light microblading the first retouch is done around 5-6 weeks after the procedure and all the following retouches within 6-8 months from the previous one. 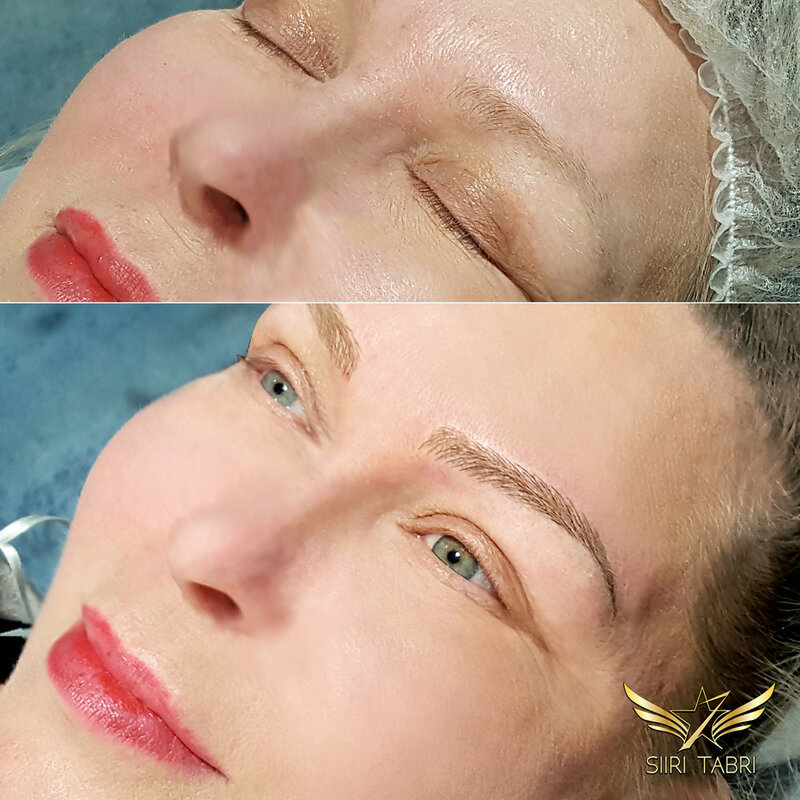 When conventional microblading often healed in an aesthetically questionable way - lines remained thick, edges of lines became blurry or lines spread, Light microblading heals to a flawless shading-like result. Lines just become lighter and lighter over time. How often the brows have to be "renewed"? As said, a well done microblading has to be renewed only once a year and that has also been our experience. We strongly believe that eyebrows are hyper-important and to keep them looking perfect for a year with one renewal procedure is a barging in any and all ways according to our experience. However, we suggest to come for a quick aftercare and consultation whenever you see a need for that. Clients and eyebrows differ to quite a large extent. 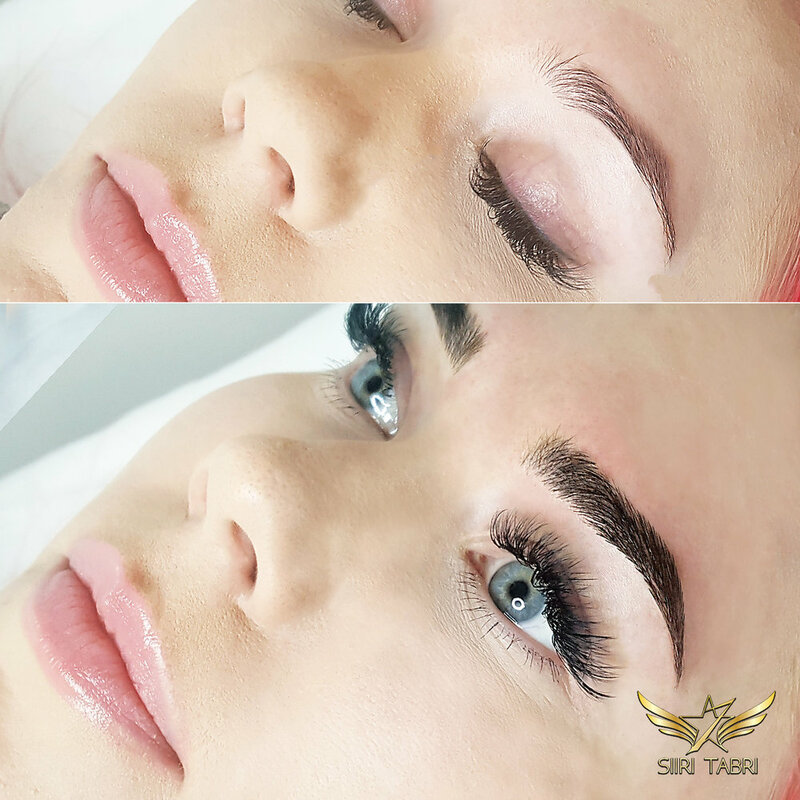 Thus it is important that you analyse the state of your SharpBrows microblading and whenever you feel the need to have it retouched just contact the SharpBrows brow processional that carried out the the procedure. 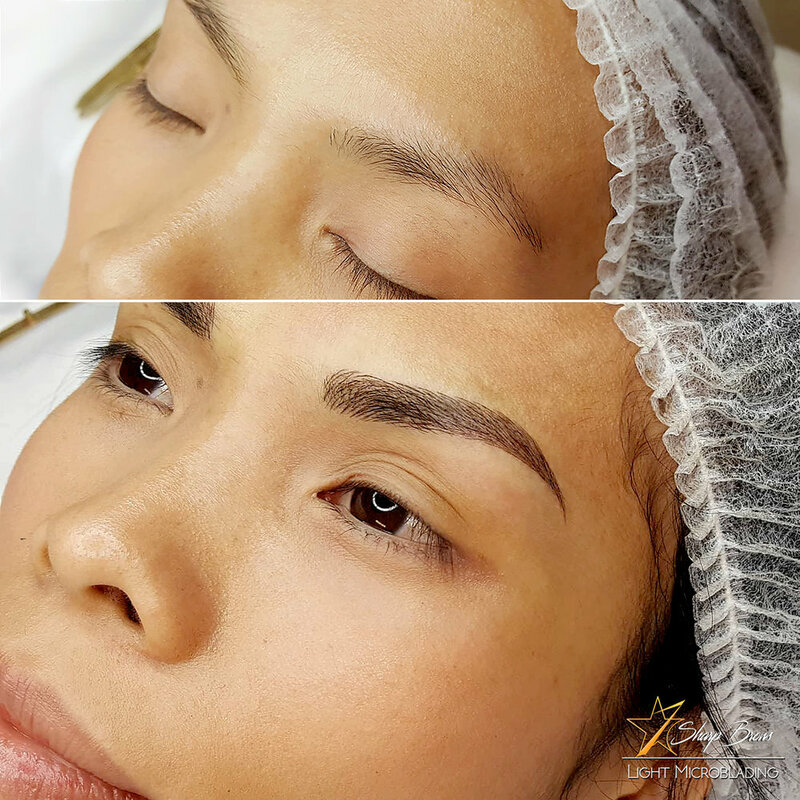 UPDATE: As stated before, it would be reasonable to retouch brows within 6-8 months after the last retouch. 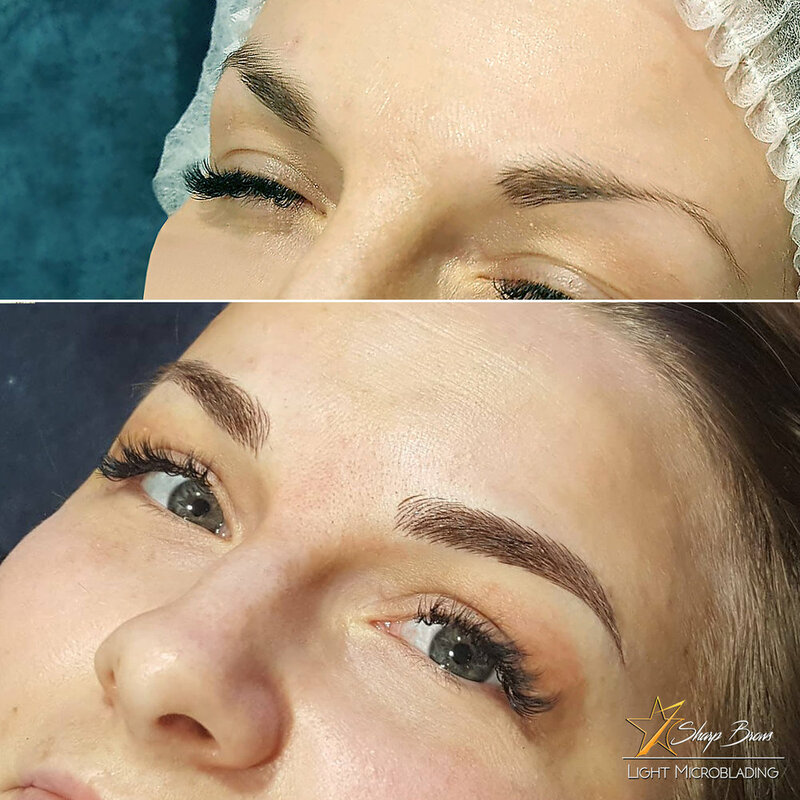 Compared to conventional microblading retouching session of Light microblading is considerably shorter. Artists just opens the wounds with RazorSharp yellow u blade (or any other high quality precision blade), rubs the pigment in, waits for 10-15 minutes and the retouch is done. Is the SharpBrows microblading procedure painful? Of course, it depends greatly on your pain tolerance but generally we can say: definitely not. If you have ever had a “real” tattoo then these procedures can definitely not be compared to each-other. 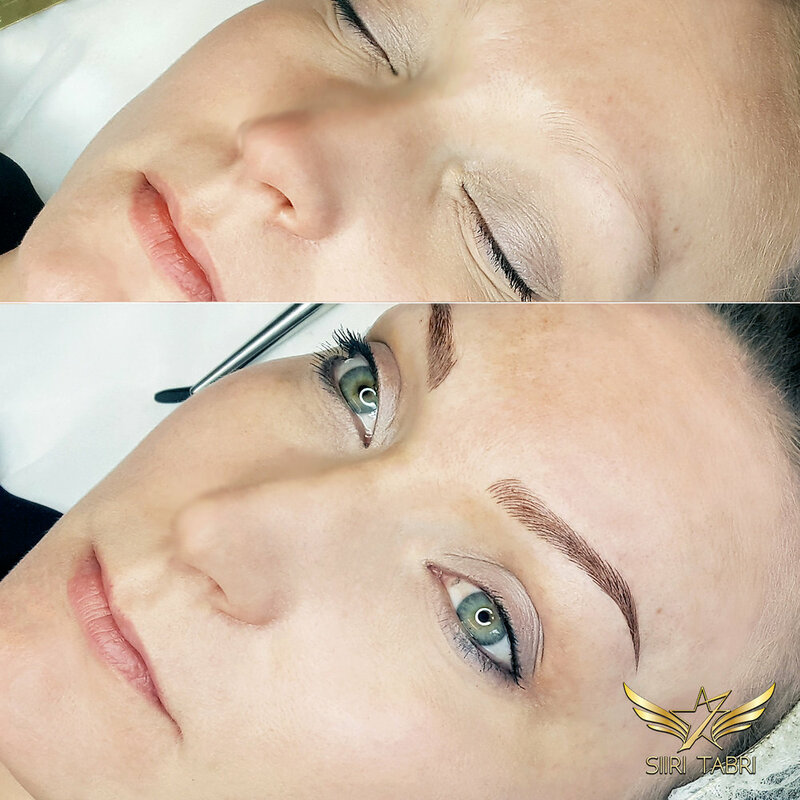 Microblading is a total walk in the park compared to a real tattoo when it comes to causing pain to the client. However, just to make it even more convenient we use different numbing creams in different phases of the procedure. Many clients have said that microblading causes far less inconvenience and pain to them than for example heavy threading. Thus you don’t even have to be afraid. It’s just a different sort of feeling and may be a little itchy but it’s not painful. UPDATE: When it comes to Light microblading pain is no longer an issue at all. Thus it can be said that anaesthetic is used in Light microblading for much other purposes than in conventional. In Light microblading it just keeps blood in lower layers of skin so that it would not blur the lines at all. 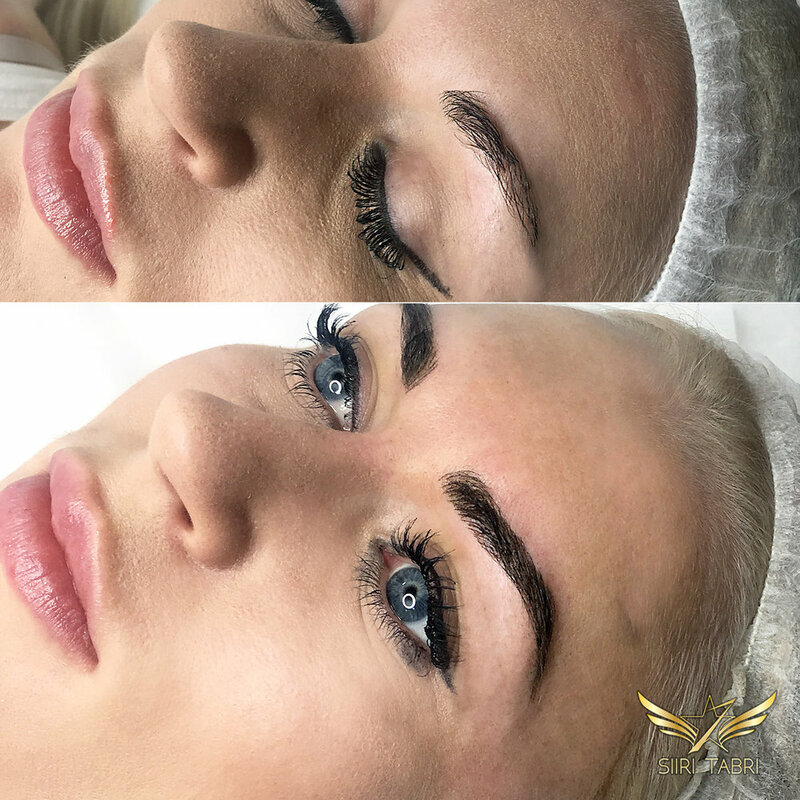 As there is no actual pain, often Light microblading can well be advertised to those that have postponed taking microblading before as they were afraid of pain. How do I need to prepare for the procedure? 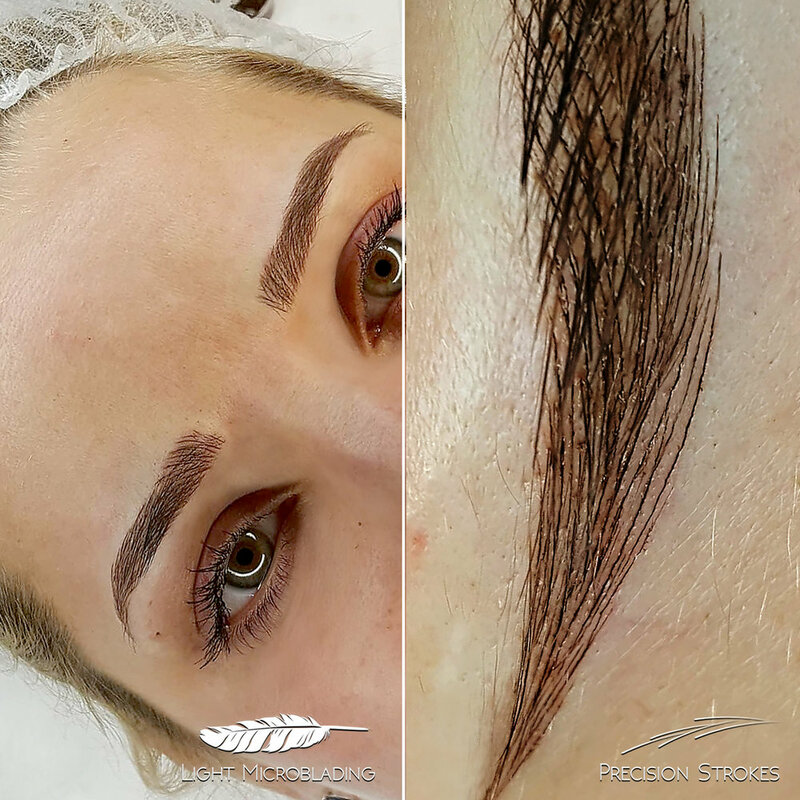 One of the many pro-s of SharpBrows microblading is the fact that it can be done practically “on the fly”. What do we mean by that? In a word: it doesn’t require any special preparation or mysterious preliminaries. That may also be the reason why some of our clients from other countries, let’s say Finland, have woken up with an idea to get microblading brows done and in the evening they have already walked out of our microblading salon happy with the job done. Although, of course, if you want to know more about all the nuances regarding prepping for the thing you can read a whole article dedicated to that. UPDATE: With Light microblading there is also no need to prepare. As well as after-care is considerably easier. In many cases (if the skin of the client is naturally moist enough, nothing is put on top of the brows). How long does the SharpBrows microblading procedure last? As a rule microblading can take up to 2 hours and if it is your first time then you can also count on it taking the 2 hours. Why? Because professional artists do not rush. Our fist and foremost important goal is to achieve professional results, thus we take our time. 2 hours include preparation, designing the brows and getting the actual microblading done. As this a procedure that affects your looks for an entire year you should not under any circumstances consider 2h to be too long. UPDATE: With Light microblading the duration of the procedure is practically the same. Larger number of phases makes the procedure longer, adding anaesthetics and pigment simultaneously on the other hand, makes the procedure shorter. Obviously, the length of the procedure varies greatly when it comes to different artists. Beginners reserver 2.5 hours, whereas several SharpBrows masters have completed 15-20 procedures a day on exhibitions (Do not try this at home). Does one need to take a day off for the procedure? The general answer is: no. It is not uncommon at all that a person comes to the procedure on her lunch-break and then just skips a an hour or two of work. What is actually important is the following: you don’t look messed up after SharpBrows microblading and you can calmly return to work without being afraid that you co-workers react to that. 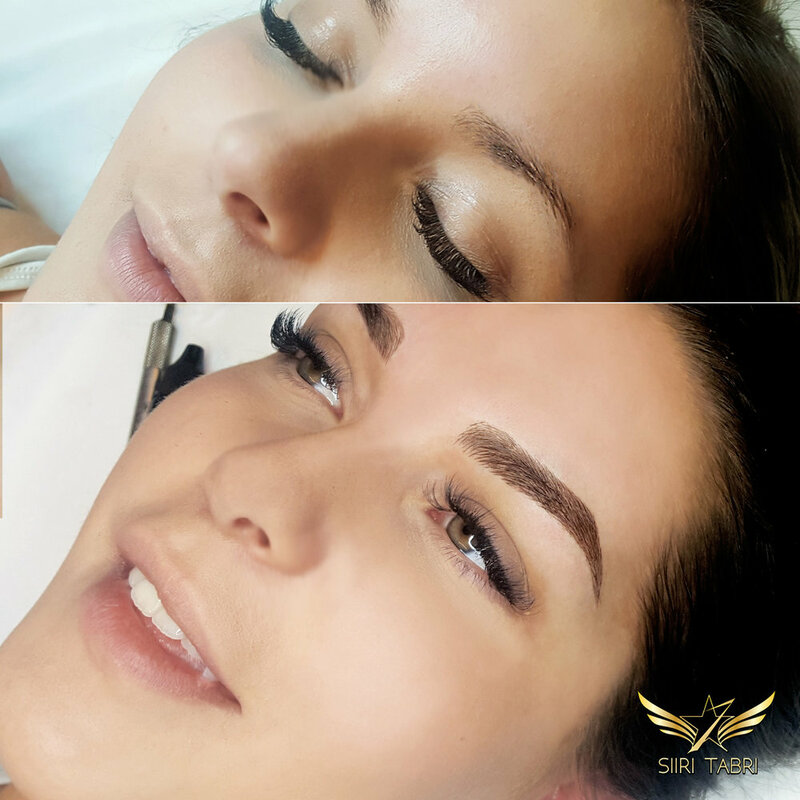 Having SharpBrows microblading done is not like having permanent tattooing done and thus you’ll be perfectly fine-looking after the session. Just be prepared for a lot of questions about your ‘new brows’ from your coworkers. UPDATE: Obviously, with Light microblading there is no need to take the day off. 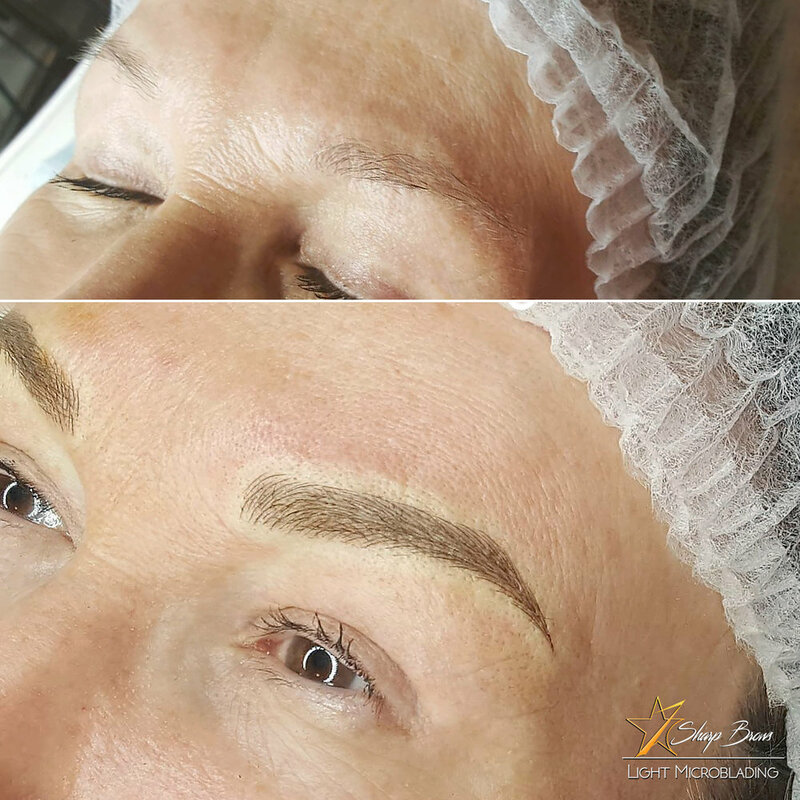 Quite often microblading nowadays can be a pretty spontaneous decision (of course if you can get an appointment with the right artist). How long does it take for the skin to fully recover? Usually a week up to 10 days. You can be sure that smaller bits and pieces of your brow skin will fly off during that time. It takes around one month for the pigment to set in completely and therefore, if needed, we will also perform a little touch-up after a month. When you decide to go for a procedure that includes the touchup you can be sure that the result is just per-fect! 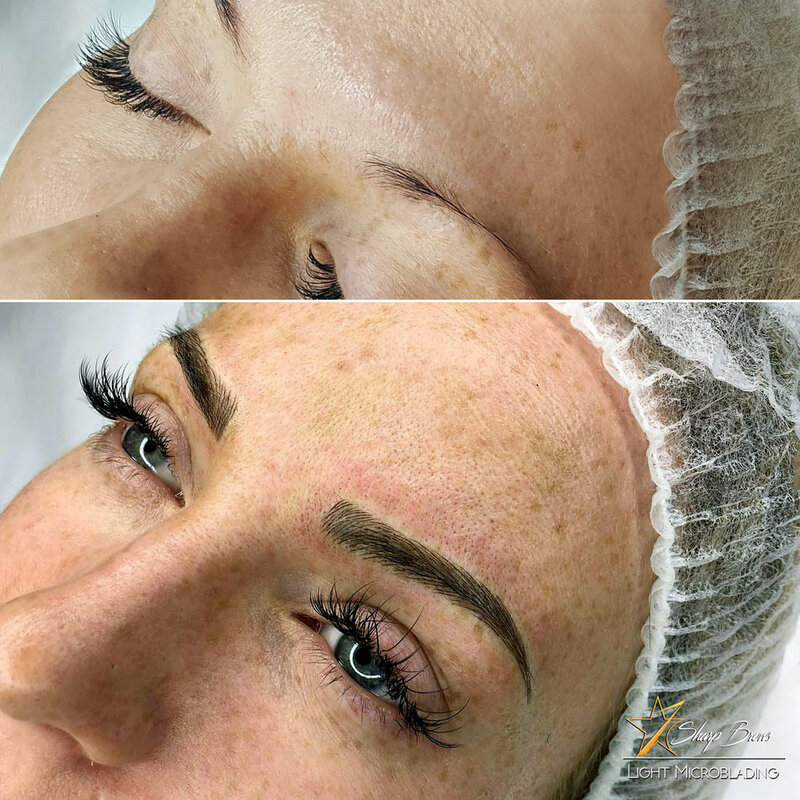 UPDATE: When it comes to Light microblading the recovery process is actually even faster compared to conventional because wounds are more on the surface and damage to skin is smaller. However, usually retouching to Light microblading brows is done a bit later (5-6 weeks from the initial procedure) because that way the most durable result can be achieved. Still, it has to be noted that the most dangerous time is 72h after the procedure, because then the top layers of the skin are are opened. What exactly happens in the human skin during the procedure? 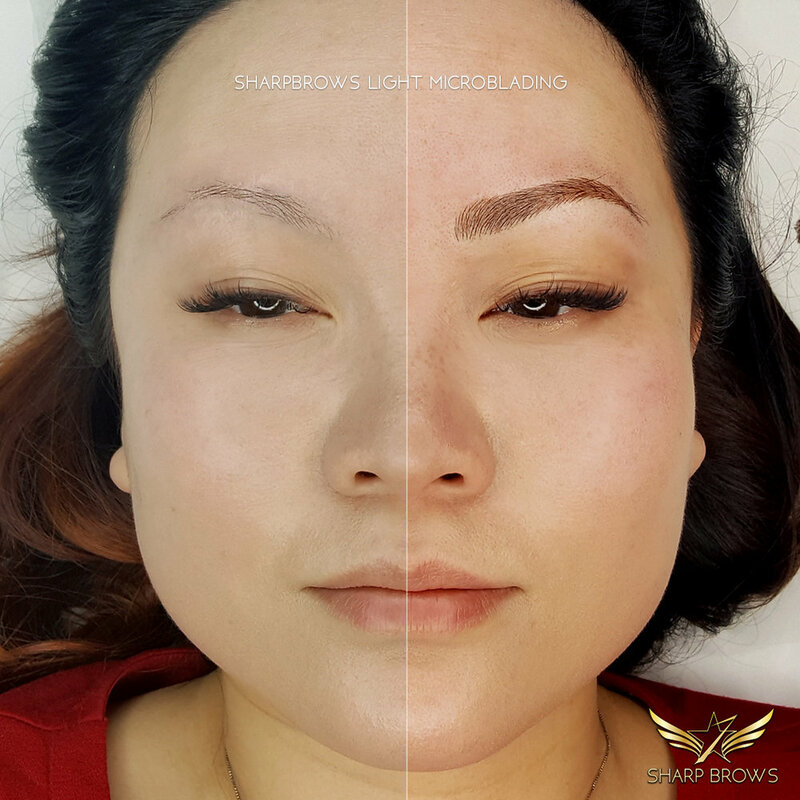 When we zoom deep into the actual procedure of SharpBrows microblading we come across the following three phases: design, the actual process and fine-tuning. Thus during the first phase we will design you perfect brows. This means that we use special tools to measure the different parts of your browline, as well as your facial features and draw so-called ‘new brows’ to on your skin. When you see and approve the design we’ll suggest you pigments that match with the color of your skin and hair the best. During the ‘blading’ phase we use a microblading blade that actually consists of 11-18 tiny blades to slice the pigment into the surface layers of tour skin. 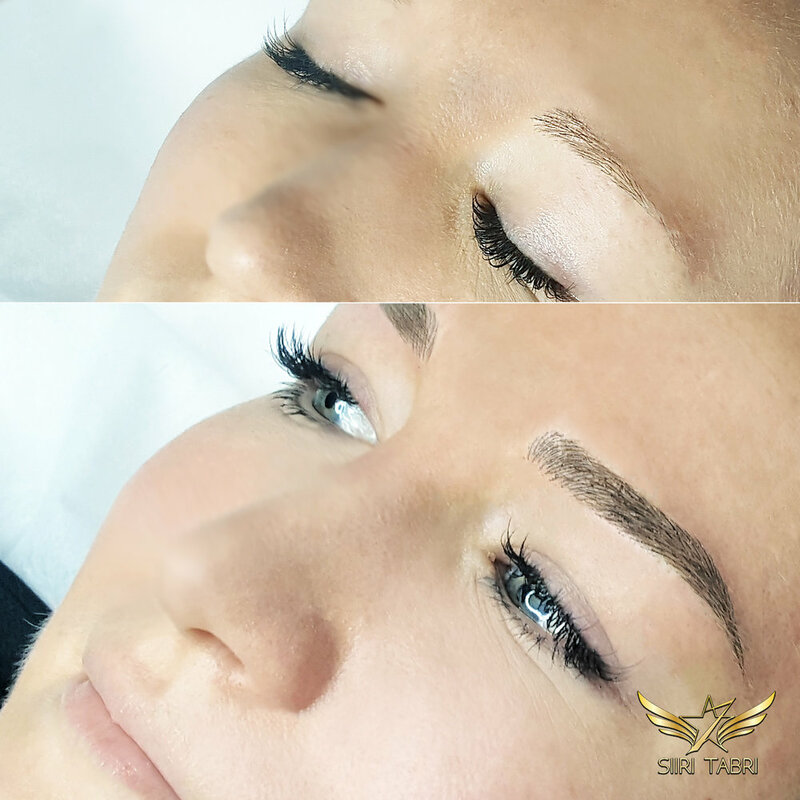 As this phase looks a bit like tattooing many people may get the false idea that there is something in common when it comes to perm tattoos and microblading. However, that’s the integral part of the procedure and it indeed results in you having ‘perfect new brows’. During the fine-touching phase we use different calming creams on your skin and tell you all about what is going to happen in the following days. You will get fully prepared to cope with your changed looks and take the best care of your new microbladed brows. UPDATE: With Light microblading the principal healing process is the same. However, as the wounds are less deep everything can happen a bit quicker. All professioanl artists should always stress the clients that there will be a phase during the healing when old dead skin falls off and pigment within the basal membrane is not yet seen clearly. Very often this leads clients to believe, falsely in wast majority of cases, that brows "have disappeared". If microblading is done well everything normalises quite rapidly and within a couple of days lines are seen. Can the procedure be dangerous? Is all the instructions are followed then the procedure is not dangerous at all. The most important thing is to keep your skin dry and clean. This means that you should not jump into a pool within a couple of days after the procedure. As well as we suggest you not to go in for physical activities that cause heavy sweating. Solarium is a big no-no for at least 72 hours. In addition to that you should not be touching your new brows during that time. We all know that the skin starts really itch and you want to peel off smaller pieces of dead skin, however you shouldn’t do that! No strong anti-aging creams or other anti-aging products should also be used right after the procedure and during the first 48 hours. UPDATE: We can affirm that with Light microblading all complications are even less likely to occur. What pigments are used for SharpBrows microblading procedure? During our classes we demonstrate different pigments as we are not a pigment producer ourselves. However we generally suggest to use pigments that do not include any metals except iron oxide and are 100% harmless. If the pigments used are not with the highest quality or if those contains any sort of metals except iron oxide, the results can be pretty devastating: not only rash but also pinkish, close to blueish or even orange skin-tone, heavy irritation and other worries. UPDATE: When it comes to pigments SharpBrows has 3 lines of pigments: Light, Generation 2 and Premium. The main difference of the pigments lies within their thickness (Premium is the thickest, Gen2 is somewhere in the middle and Light is the thinnest). 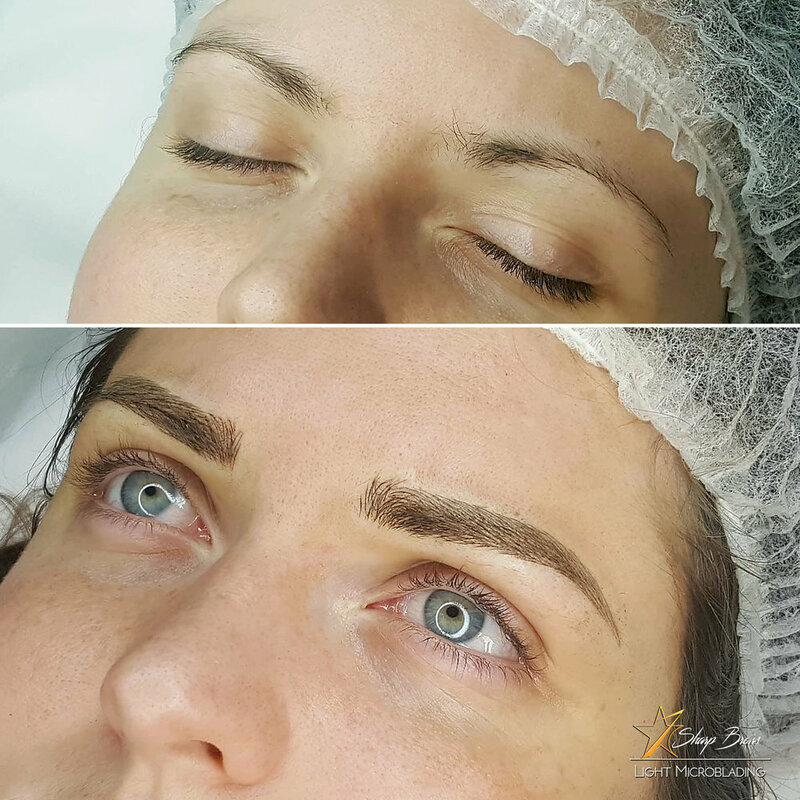 What are the contracictions to the SharpBrows microblading procedure? There are some rare types of skin that does not react to microblading well. However, you can be sure that you know it before even considering going for microblading because then you also usually have all sorts of other problems with your skin. There have been a couple of clients we have turned down because of especially oily skin, however, this means that the skin must be really remarkably and unusually oily. You should not go for microblading if you have moles close to your brows and also when there are large capillaries or keratosis in your brow area. 2) Client suffers from skin decease that causes keloid scars to appear. 3) Client is allergic to Lidocaine (if anaesthetics is used). 4) Client has had botox injected to the upper part of the face within 2 weeks prior to procedure. 5) Client is underaged (and has no parent with him/her at the procedure). 6) Client does not experience initial phase of hard complicated decease (cancer, lupus, anemia, leukemia etc) when doctor of the client tries different medication and healing procedures. 7) Skin of the brow area is totally damaged and scarred. (That actually is not an absolute contradiction, still it makes making microblading just pointless). Here you can see a throwback picture from the beginning of 2015 when microblading took over Europe. 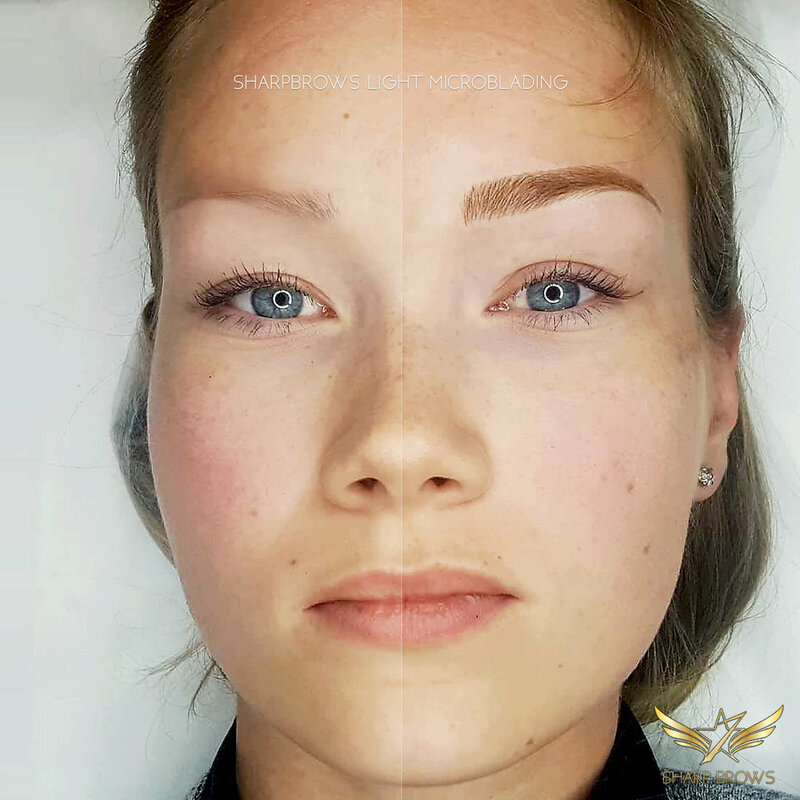 SharpBrows was one of the first companies to start microblading trainings in Europe in the beginning of 2015. SharpBrows was formed by EverYoung Inc in Switzerland in December 2014. 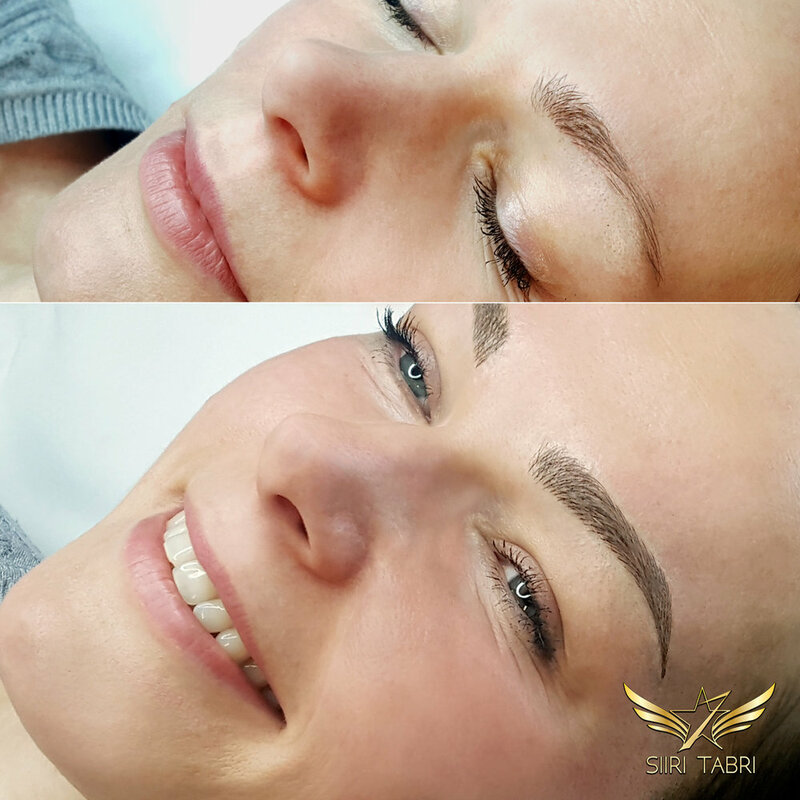 Now well-known and highly acclaimed microblading master Siiri Tabri introducing microblading in trade fairs when it was totally unknown and new technique, in the end of 201€ and beginning of 2015. Most people were sceptical and tried to convince others that "it ruins the brows and will soon be forgotten." Now, in 2018, it can be said that they were mistaken. The first version of the SharpBrows logo with the sign representing Japan (hieroglyphs stating "Japan" in old Japanese). 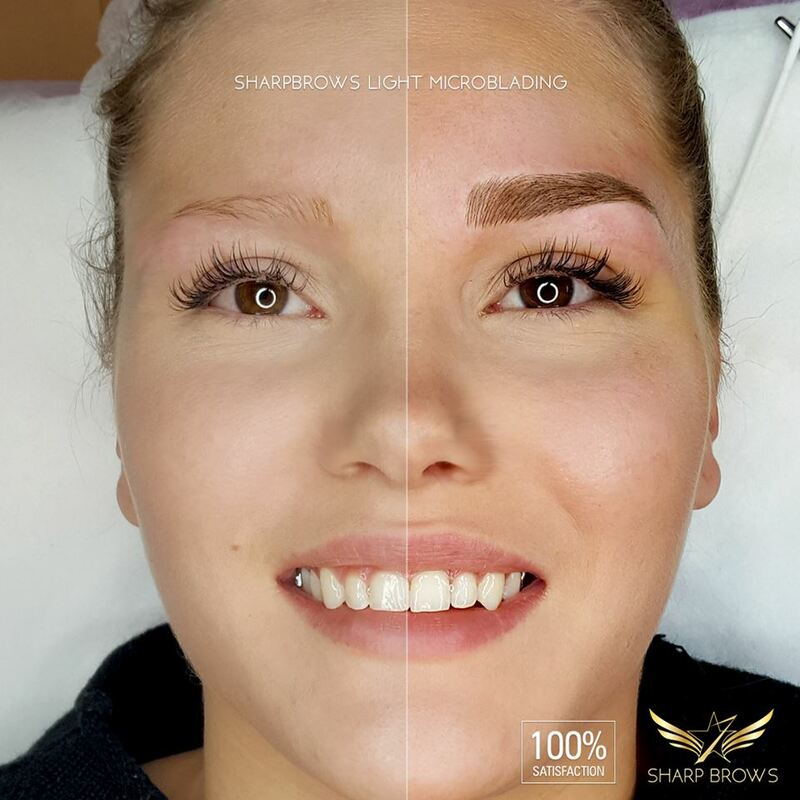 After that SharpBrows logo has gone through 3 rebranding processes (first in 2016 when BrowShading was dropped, second in 2017 when the slogan 'No 1 on Worldwide microblading' was added and third in 2018 when the final version ('the wings') was taken into use. 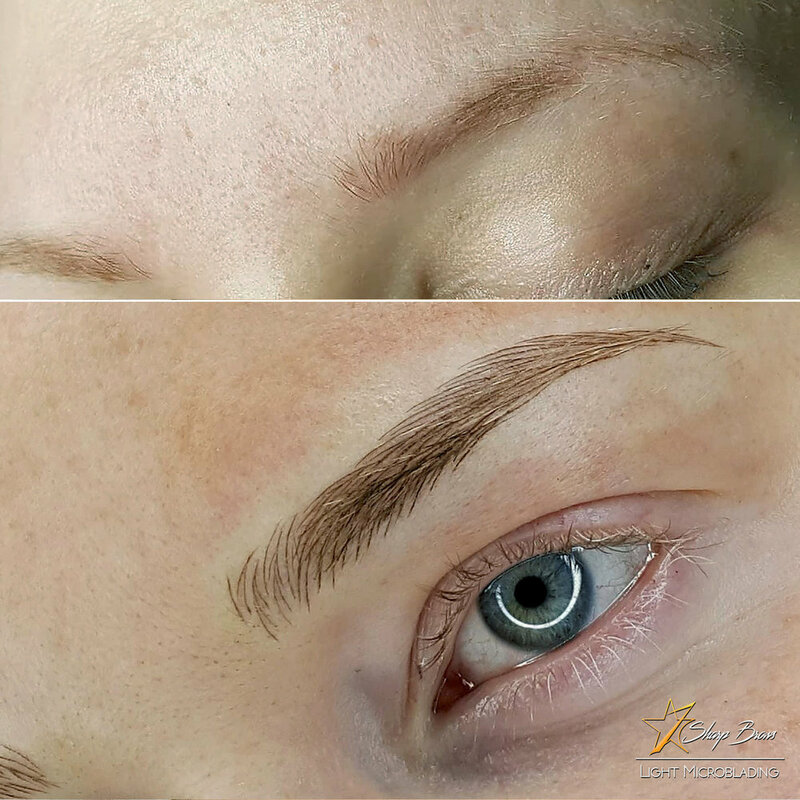 Although Light microblading is even better, more precise and vastly superior to conventional microblading, here one can see that brows made during the years 2015-2017 with the conventional microblading technique, were also the very best that could be achieved in the field of microblading back then. Do not just take our word for it, explore actual brows made with SharpBrows Light microblading technique.